Reclaimed boards and stringers are used to refurbish pallets and skids efficiently which saves our clients the expenses of purchasing entirely new pallets constructed from virgin lumber. 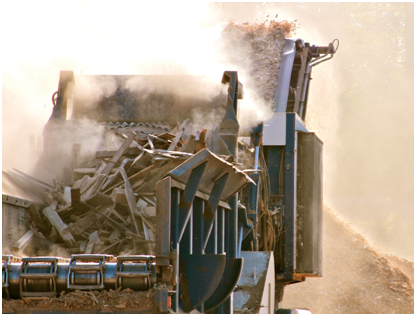 We reduce the amount of scrap wood ending up in landfills and waste removal expenses by using a quality-controlled, on-site location to grind scrap wood into a usable material. 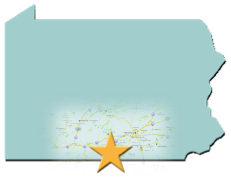 Every part of our process is as eco-friendly as possible as scrap wood is shred and chipped into animal bedding that is used by local farmers in the Cumberland Valley area... making even our byproduct green. We estimate that each truckload of recycled pallets saves approximately 83 trees from being cut down and manufactured for lumber to build new pallets (based on one tree producing ≈ six pallets). During the grinding process, a high powered magnet draws the nails up and out of the mulched wood. This makes for the safest, quality product for animals to use as bedding and for home owners to spread around flower beds. 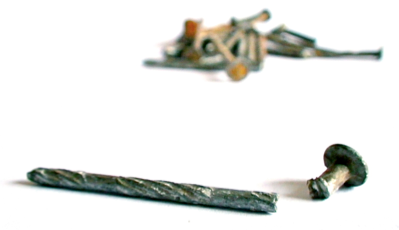 Once the nails have been removed, collected and taken to a local recycling plant, they are melted down into reuseable steel.